Do you know why paralyzed dogs develop urinary retention? If the term is unfamiliar; you are not alone. The average pet parent will probably never hear this diagnosis. On the other hand, owners of paralyzed pets, hear these words too often. Urinary retention is a condition where a dog or cat cannot fully empty urine from their bladder. The urine sits in the bladder where it can become infected or it expands the bladder until it is over distended. Urinary retention is a serious and painful problem. Because the majority of paralyzed dogs are also incontinent, they are prone to developing urinary retention as a medical complication to their overall condition. Able-bodied dogs and cats can develop urinary retention, but typically it is due to an obstruction. Pets with this form of the condition require surgery to remove the obstruction. The blockage is generally caused by a bladder stone, bladder crystals, a tumor or a physical abnormality. It can also be caused by kidney disease. Depending on your dog’s symptoms your veterinarian will order tests that range from a urinalysis and bloodwork to a Myelogram or CT scan. The scans are ordered to determine whether a rupture or lesion might be causing the problem. Dogs with urinary retention are generally hospitalized. They are put on a catheter to release the excess urine. Your veterinarian will also determine if there are electrolyte imbalances in your dog’s system that were caused by the buildup of urine. The overall goal of the treatment is to get your dog’s body to return to whatever normal function it had before the retention. This is true even if your pup’s hind end is paralyzed. Most dogs respond well to treatment and do not have any side effects. As the owner, you might be asked to attend a refresher course on how to manually express your dog’s bladder. 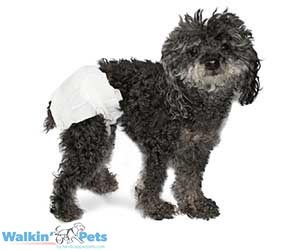 Other dogs with urinary retention will need to be catheterized when they go home. This will keep the problem from recurring, but it requires the owner to learn how to insert the catheter for manual expression. Check out products to keep your dog dry. You might want make some corrections to your post. Its hard to understand some of the points your getting at. You mentioned a miracle cream you use on yourself and also used on your dog. Now your dog is walking again. I’m happy for you that your dog is able to walk again. But do note the above article is about why paralyzed dog have urine retention. Sean, The medication Rosalinda was referring to (CBD) is one of the ingredients in Marijuana. It is being used to relive a host of ailments in both humans and pets. Keiki, I keep hearing good things about CBD oil from pet owners. I have to admit that it is a product idea that I struggle with, but it might be time for me to join the rest of the world who are seeing good results. Please don’t think that your dog isn’t happy without the oil. Maybe it is just giving her the extra edge her body needs. I use the CBD oil and I want to for my paralyzed sweet dog.. her hind legs and now I noticed muscle spasms last night and she’s not peeing a lot at all and all the symptoms I read .. so how are giving drop to the pets? How many drops and in food? What Strength?